Looking for an easy lunch sandwich? This hummus and veggie sammie is the answer to your lunch problems! I do not like avocado. I may have actually talked about this already – I’m not sure. Unfortunately (fortunately?) I talk a lot, even here, and some of my “shtufff” gets lost in the babble. But since this is a food blog and we are food lovers together, I thought I should talk about it one more time. I can eat it in sushi as long as I don’t know it’s there. Kind of like sardines – I can eat them in salad dressings, as long as I can’t see them. I once ate an entire Jimmy John’s sub before I realized that it was someone else’s vegetarian sub, full of avocado, and not my turkey sub. Once I realized it was full of avocado, I was like ewwwww. But while I was eating it, I thought it was pretty yummy. Who does that? So as I watched this crazy avocado toast craze that I keep seeing on the blogosphere, I got all sad because I can’t get involved. No way am I going to eat avocado toast if I can see the avocado all squishy and mushy-like on the bread. My solution is hummus toast. Equally mushy and squishy but for some reason I am not squeamish about it. 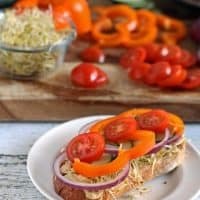 This sandwich is easy to make and perfect for lunch, or even dinner on a meatless Monday if you cram enough veggies on it. 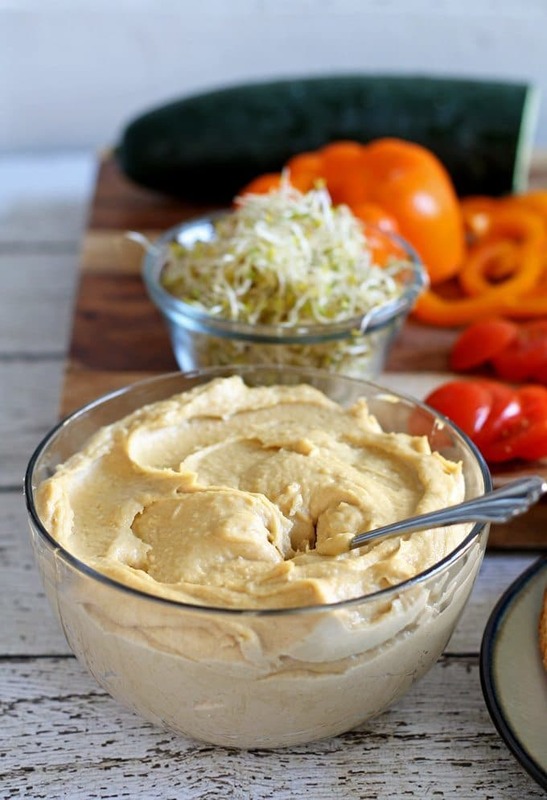 Start with your favorite hummus. You can go the store-bought route of course, but I much prefer to make my own at home. Store bought hummus is often packed with unnecessary preservatives and 10 letter words I don’t know how to pronounce. It’s so very easy to make at home that I find there is no excuse to buy it at the store. Of course I have a favorite hummus recipe, and no, it is not one of my own. Sometimes, I am under the opinion that if it’s not broke don’t fix it and that is how I feel about this delicious hummus recipe. I usually use canned beans anyway and just make sure to rinse them well and make sure that the skins are not still attached. 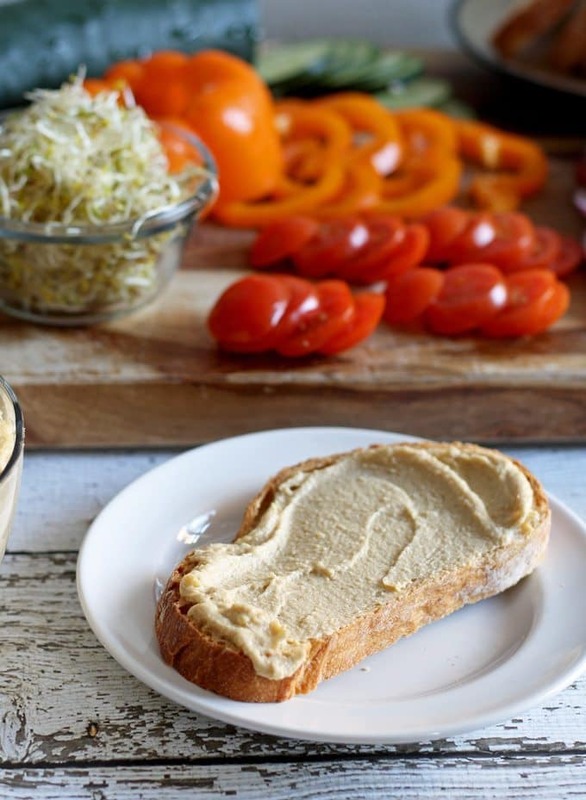 Spread hummus on your slice of bread. Top with sprouts/micro greens. Then top with your vegetables. Mmmmm, this sounds delicious. I’ve been feeling like making some hummus lately so seeing this is very good timing. Just had an early dinner, but this makes me hungry again ! Looks awesome ! This looks like a fantastic healthy lunc! I love avocado but I thought I hated it for the longest time, I think it’s the mushyness! I totally get what you mean though, like mushrooms I violently hate and will pick them out of everything – but then I recently tried some and I was like “oh these are okay” but I still pick them out of my food and refuse to eat them haha! 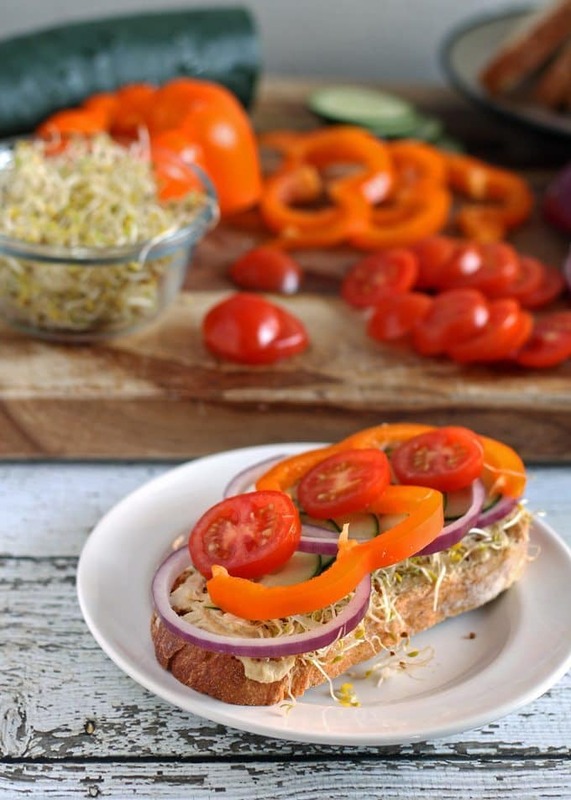 This hummus sandwich is definitely a yummy alternative though, avocado lover or not! Lol, Michelle – I am glad someone else understands. I only got into avocados a few years ago — before that, I had that same “ewww” reaction. But I do like hummus on toast, and this looks like the perfect simple weekday lunch. Thanks Bev! I need to keep trying to eat avocado I think. This sounds wonderful! I love hummus and veggie sandwiches!